There was a slight downtick in California manufacturing job growth in September, which tracked with the national numbers too. Still though, California lags the country since 2010 and the end of the recession. 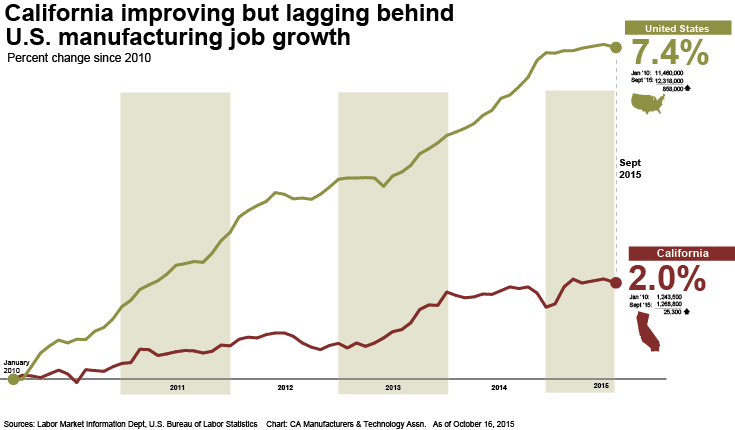 California is up 2.0 percent in manufacturing jobs while the U.S. is up 7.4 percent. Today we learned that California gained 4,300 manufacturing jobs in March. We all understand that this sector's growth means more opportunities for our working middle class, the retention of critical technology and innovation, and tremendoous ripple effects in our economy. California must keep up the fight to retain and attract manufacturing. This week we looked at sector wage growth adjusted for inflation since 1990. 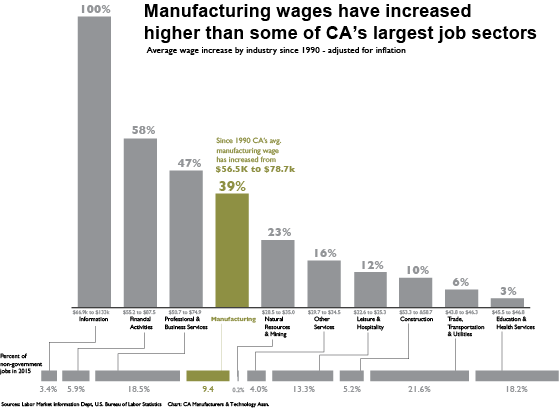 California manufacturing wages have not only kept up with the average increase with 39 percent growth but it is the second highest among California's five largest sectors. 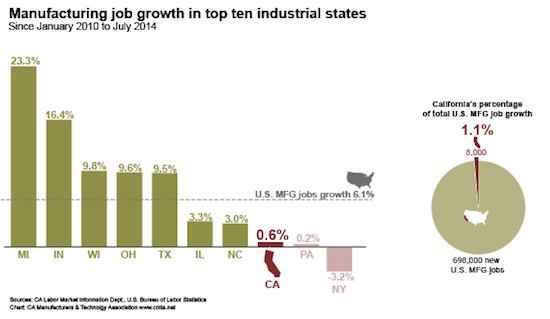 Last week we looked at some of California's top sectors and their growth versus the country. This week we're looking to see how California's manufacturing job growth compares to the top ten industrial states. 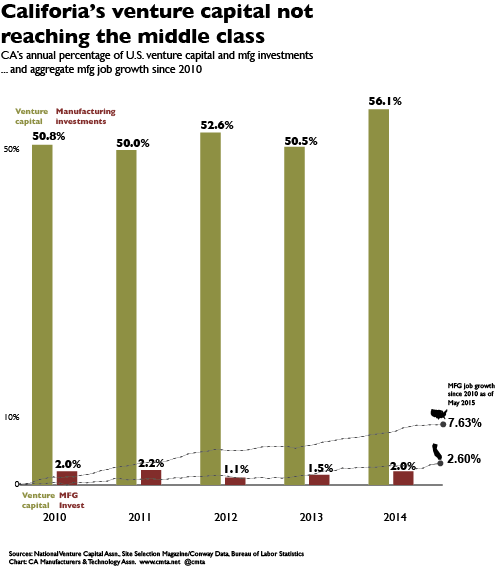 Since the end of the recession in 2010 we were seventh among ten with 0.6 percent growth. New York, Pennsylvania and California were at the unfortuante end of the growth chart. On the flip side, Michigan and Indiana are doing something right, growing their manufactuirng bases by 23 and 16 percent in the same time period. We also found that California has attracted only 1.1 percent of the country's entire manufacturing expansion and re-shoring renaissance since 2010. Every Californian, along with CMTA and Governor Brown and his GoBiz economic development team, must Champion the cause of attracting new manufacturing investment to our state. After California's manufacturing sector lost another 5,900 jobs in September, we thought we'd update and get a fresh look at how California is stacking up against the rest of the nation. Here are the updated numbers and charts.